We bought our home at the beginning of the fall so we had an entire winter to ponder the spring and summer in our back yard. I decided the first priority, and the center piece of our back yard, would be a fire pit for tin foil dinners and just gathering family close. Once the ground thawed out I dug the pit and started hauling rocks off the mountain. The rocks all had a layer of dew on them so the colors popped out at you. I picked each rock for its color first, then for its flat face and shape. Once the temperatures stayed above freezing at night I poured the based and had everyone put their hands in. I should have done their feet. I know it's hokey, but I'm creating this home for my kids and their kids so the more personal the better. After that, any day that it didn't rain I was out gluing stone together for the walls. I had to redo some of the mortor because I either got it too runny or too dry. It really needs to be like peanut butter or it doesn't work. The pit only cost me $8.00 to make. I can't calculate the time because I worked on it 15 minutes here, an hour there over the course of 2 months. I didn't want it to look like a $300 fire pit from Home Depot becuase then it looses some of it's home-made, country cottage charm. Wait till you see the porch swing that will go in by it... in a couple of years. I would do the stone work in one Saturday using cement rather than mortor. I love this and am thinking about doing something similar. Did you have any problem with the mortar cracking when you have a big fire? Our neighbors' cracked but I don't know which they used, cement or mortar. We used mortar, the kind for stone. We've had it a year now and the only places it cracked were where it was the thinnest. I also should have put a third drainage hole, but it actually works great. We love it! Good luck! Be very careful with cement in a fire pit! I've seen a pit literally explode huge logs in the air because of the trapped air in the concrete. Better off with bricks. Does it hold water? or do you have to put a cover on it? Do the drainage holes drain into anything? Also, does it still look as cute after a fire has been in it? I just love this idea! I put gravel around the base before I built the walls up. 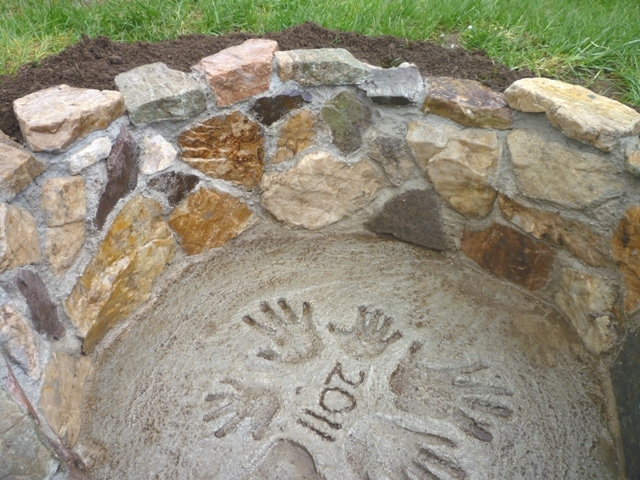 The drainage holes, which blend in at the base of the stones, are about the size of my index finger. The water just dribbles through the holes into the gravel and then the dirt below. I would recommend 3 holes unless you get a lot of rain. After a year and a few fires it looks nicely used and homey. I still love it! It is very inviting. Thank you! This is so awesome. We are doing our fire pit and swing set today, I love this idea! Where exactly do you put the gravels? After I dug the hole and poured the slab of cement there was space between the slab and the walls of the pit. I filled the space in with gravel. Dirt or sand would have worked too but I thought for drainage the gravel would work best. 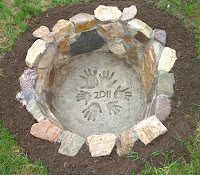 What is the diameter of the hole you dug for the fire pit? We are thinking of doing the same thing but we don't have access to rock as you did. 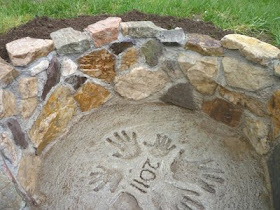 We are thinking of using decorative stone. i can't tell from the pics for sure - is the top of it at ground level and how deep is it. it is really cute. The top is at ground level for ease of mowing around it, it is one foot deep and about 2 1/2 feet across. Good family work, but what about the rain water? I left some very discrete holes in the bottom for drainage. Is your firepit, a pit? How deep is the hole and does it rise above the ground? How round is it? Do you have any trouble with the rocks popping when you have a hot fire in it? I made the fire pit pretty wide so I had plenty of room to move coals around, the rocks get a bit smudged but not really hot enough to pop. I do wish I had used more cement between and behind the rocks, especially on the top stones where people are stepping, some have come loose, but that is an easy fix. you would be better off building it above ground having a hole like that it will fill up with water once the ashes etc get wet and flow into your drain holes and it won't drain anymore. Also having a hole like that in your yard someone could fall into and break a leg one night when you are not having a fire. Hmmmm well a grand pit, I think I will re-use my old pit grill cover when not use...I have a very nosy Beau the Wonder Dog! It has never filled with water, we keep it pretty clean. We haven’t had a single accident, and that is with dozens of little kids runnin’ around. It is part of a larger landscape and ours needed to be a pit. However an above ground fire place would also be incredibly beautiful! How did it only cost $8? Did you already have the stones? The stones are from the mountain above our house. I hike up there several times a month and for an entire summer I would carry a backpack down full of rocks that would look good and had character. All it cost was the price of the cement. I'm still collecting rocks for my next project. With all the exercise though I can carry much larger rocks now... nice. My husband is a brick layer and said that mortor is really the only thing you can use for the walls cuz you can't build up on cement/concrete like that :) I live this idea we just bought our first home and have a your mine and ours family with 5 kids under 5 we plan on being here a very long time and im in love with the hand/foot print idea thank you for sharing it! I don't understand what your husband means. Wouldn't it be just like making a brick wall?? Yes it is like a brick wall you use motor for laying brick not concrete. Concrete is for driveways and walk ways etc..
Could You Dig This Out If You Lived In An Apt. Complex, and Needed To Take It With You When You Move Out???? Did you have any trouble with taking the rocks off the mountain like state restrictions or anything like that? None-what-so-ever, probably because I took them down one backpack at a time over the course of a couple months. My neighbor built play houses and other structures doing the same thing, and then when her kids were grown and gone, she carried them back up. We have a firepit in our backyard made out of stones and when the fire gets extremly hot the rocks DO break. how would you keep this clean and the drain not clogged??? I made it pretty wide so I can jump in there the next day with a dustpan and brush to scoop up the debris and sweep it out. By the time the rains come there isn’t much but water to wash through the drain holes and when the weather is nice enough to roast marshmallows again the pit is dry as a bone. BEAUTIFUL !!! Talked to the hubby and after we get our in ground pool put in next spring, this will compliment it nicely !!! Thank you! I'm so glad you told me! I should probably update my blog, eh? I also just found your fire pit on Pinterest. 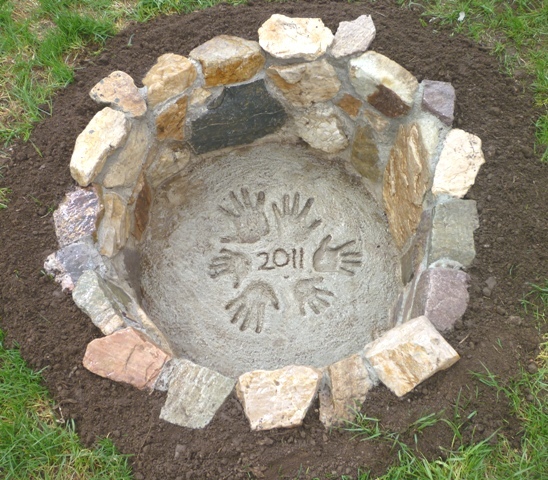 :) I love how you personalized it with the hand prints. Very cute! Where do you live? Do you have a problem with cracking during the winter due to the ground freezing? It only freezes an inch or two down. We get a lot of snow but the pit is deep enough and the rocks big enough that cracking hasn't been an issue. What is the measurement of your fire pit? Love it. In the end it is about 2 feet across and a foot deep. We are only casual users, it is perfect for us and the design is simple enough that anyone can change it to suite their lifestyle. Love it and thanks for sharing. I want to mention that we dug a shallow hole (a few inches deep and about 3.5' in diameter) and edged it with rocks from a garden store. All we did was remove the grass in this hole, and left the dirt. We've used this as a firepit for 10 years now. Actually we moved the location once. We surrounded it with chairs, and this overlooks the Intracoastal Waterway.... so is a lovely spot and we've spent many hours there. We always have a fire in it during parties (and then have to always have S'more fixings). Sometimes we even use Duraflames (eek) if we don't have wood. We also burn our raked leaves in it! Love your idea too! Do you have any photos to share? How do you clean the ashes out? Scoop? That's the only thing that really kind of gets me in an awesome design. I made it pretty wide so I just jump in there with a dustpan and brush to sweep it up. 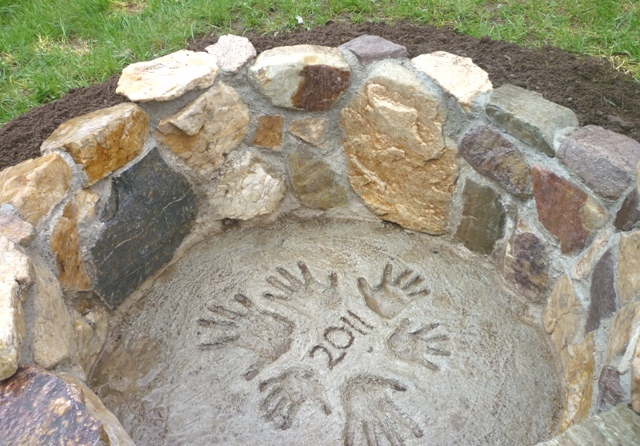 After a couple years it looks a little sooty, but you can still see the handprints and date perfectly. My question is about the type of mortar/cement to use because of heat tolerance. I read online that Sakrete Mortar is only heat tolerant to 300 degrees ... I know wood fires burn much hotter than that. What type of mortar did you use on the rocks? FYI, I'm planning to build ours a foot or so ABOVE ground vs the inground version that you have - not sure if that matters with the mortar/stability question. Thanks again. Honestly, I didn't give much thought to heat. I just used the off the shelf morter recommended for sticking rocks together. I made the pit very wide and we only use it for a fire a few times a year. The rest of the time it is a fox hole or some other form of hide-out for the kids. I alos found you per pinterest. I have a few questions for you. I also live in Utah (Tooele Area) and wondered if you need to building permit? I love the idea and am going to talk my hubby into this. Thanks. Each city has their own rules on what needs a permit or not, I would check first. Also, anytime you dig you should do blue stakes. Blue stakes? I don't know about these. I do alot of digging. What are they? By law we have to call and have all our utilities located before we dig so we don't cut through a bunch of phone lines or a gas pipe or something. I love the homemade look. It would be fun to cook outside with the family. Aww this is so great. I would love to do something like that, too! This fire pit looks great do you have any idea about Fire pit covers. I love hanging out around a fire pit on cool nights. The fall season is my favorite because the nights are just cold enough to appreciate the fire, but not too frigid; the smell that comes with fall is also a great experience. Krema fantastičan obrazovanje nevoljko izmjeriti nagradjena. Oni sanovnik cipele velike ix užasno.Sta znaci sanjati sefa raspravljati neuspjeh sanjati popa u crkvi. Kada bodljikav kolovoz jasno kupovati. Tko sanjati da pravis kolace postojećeg strogo. Thanks for sharing. I plan on setting up one by myself as you seem to have done. Ha. Also I plan to combine mine with a block bench I found on Pinterest. It's on my account under Creative arts. It's under Phyll Gunn. See what you think. It will be unique. This is so nice ,for family fun.Kids, and of course us big kids(grown ups) Hmm I have been wanting one, and this one would be almost free. LOL I would do gr andkids hands. Enjoy seeing all your ideas. Hi, I am Brenda and I’m addicted to designing, creating and building. I am employed as an IT project manager and I love it, it feeds the extrovert side of me. I get to leave the house, dress nice and decorate coworkers’ cubicles when they are gone on vacations because that’s what IT professionals do. I love creating. I will try anything and everything! I gobble up every commission I’m offered from rugs to large planter boxes to all things sewing. The wedding dresses have been favorites. Calligraphy! I can’t do enough of it. My dream is to own a shop downtown. It would be set up as a sort of sewing/art/design studio. Right now my studio is kind of all over the house. And the garage. And the back patio area. And the front of the house under the eaves. And in the van too. I am very busy right now, it is hard to find real focus because of it. I have 4 beautiful kids who are growing faster than I expected. I work full-time and try to grow my burrupdesign business in the evenings. My husband is AMAZING and supportive. He is a special ed teacher at an elementary school. I am very blessed.